If you are having difficulty finding a blast machine to meet your application demands, one thing is for certain: we’ll have it here. Clemco Industries has over 50 years of experience manufacturing superior equipment—our store is host to a variety of Clemco models designed for reliability and blast control. All machines are manufactured to American Society of Mechanical Engineers (ASME) standards, meaning you will never have to wonder about the quality. All of Clemco machines are built tough to endure real-world use. We offer both classic- and contractor-style blast machines in a range of sizes guaranteed to meet your individual needs. 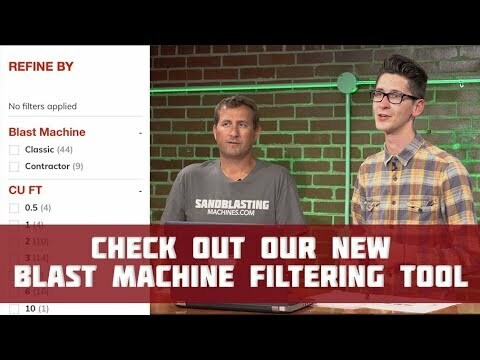 Whether you’re looking for a smaller and lighter machine with portability, or you’d prefer a stationary machine with a large capacity for abrasive, SandblastingMachines.com has got you covered. Take the guesswork out of buying a blast machine and separate, compatible parts by choosing a complete sandblasting system. Our packages include the blast machine, remote nozzles, couplings, blast hose, Apollo helmet, air filter, and spare parts. And they are all guaranteed compatible with your Clemco blast machine. We offer both high and low pressure respirator packages depending on your preferred system for delivering clean air to the blast operator.